Welcome to our official website! We're thrilled to be sharing our journeys and experiences with you. Below, you can find real-time updates from our social media accounts. To the right, and throughout this website, we'll also be continually posting longer, more comprehensive content. Thanks for your support, and come visit us again often! Congratulations to Madi and Zach on their second U.S. national ice dance title! At the 2019 GEICO U.S. Figure Skating Championships in Detroit, Michigan, they placed first in all phases of the competition with career-high scores. Their rhythm dance this season is set to two Astor Piazzolla pieces, "Alevare" and "Tangata del Alba." At Nationals, they earned a personal-best rhythm dance score of 84.56 points for a performance that was intense, smoldering, and precise. Both their required patterns showcased their deep edges and large, commanding ice coverage, while their entire performance featured crisp execution and sharp extensions befitting the mandated tango rhythm. Madi and Zach followed with a mesmerizing performance of their free dance, which is a refined, mature, and sophisticated interpretation of selections from Baz Luhrmann's 1996 "Romeo & Juliet" movie, including "I'm Kissing You" by Des'ree. Skated with the organic, genuine, and heartfelt emotion that is their trademark, Madi and Zach also showed that power, lyricism, and softness can go together in figure skating, filling the entire arena with their speed, edges, ice coverage, and deftness. Judges agreed, awarding them 131.32 points in the free dance, which included two perfect "10" scores for performance and six perfect "10" scores for interpretation of the music and timing. 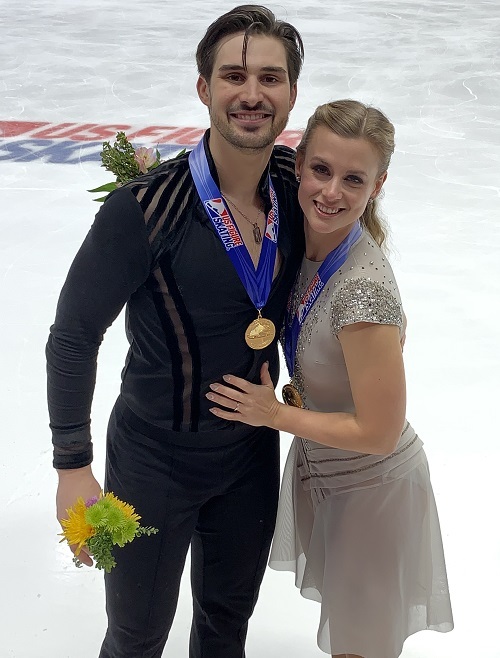 Their second consecutive U.S. title is the latest highlight to a season where Madi and Zach have skated with added confidence and have continued to improve their already world-class skating skills. In September, they opened the 2018-2019 season with a win at the U.S. International Figure Skating Classic in Salt Lake City, Utah. Then, they started the ISU Grand Prix series in October with back-to-back wins at Skate America in Everett, Washington and at the Skate Canada International in Laval, Quebec. In December, they won their first-ever ISU Grand Prix Final title in Vancouver, British Columbia. Madi and Zach look forward to representing the United States at the 2019 ISU Four Continents Championships in Anaheim, California in February and at the 2019 ISU World Figure Skating Championships in Saitama, Japan in March. A huge thanks to their family, friends, and fans for cheering them on to new heights in their career!